Yesterday, you read my review of Hazel’s new novel, My Dearest Friend (scroll down to the post below if you haven’t yet read it). Today, you have a chance to sit in on a chat with the author. DE: What is it about this time period that intrigues you? HS: I love the romance and elegance of the Regency and Georgian periods and it is this that inspires me to attempt to recreate it in my work. History has always fascinated me but it is these two eras that I find the most inspiring. DE: What sort of research do you do for your books? HS: I have several reference books and have been an avid reader of Historical Fiction since in my teens. Also, the internet is an invaluable tool and I can spend hours perusing the various historical reference sites. DE: Have you ever come across a piece of information while you researched one book (such as an anecdote or the contents of a letter) that inspired something completely different, and how did you follow through with it? HS: Very often I find just snippets of things that start the creative process going. The theme for ‘The Portrait’ came from just one line from a song in the film Hawks : ‘I want to be the man that you think I am’. This inspired all kinds of ideas. The beginning of My Dearest Friend came from a dream, which I expanded on. One element of the story came on me quite by surprise as I just found the words coming out of the sergeant’s mouth and then went with the flow. It just added extra depth to the story. DE: Do you find anything particularly liberating in this time period? If so, what? HS: It takes me away from the harshness of the present century and allows me, if only briefly, to escape into the world of my characters and live within the mores of the age. I hope this is what my readers experience too. DE: One of the things I particularly enjoyed about the book was how the friendship developed into love, instead of love following irritation. What inspired you to make this choice, and did you get a hard time for re-inventing the formula in such a positive way from anyone? DE: What are you working on now (if you’re at the stage where you can talk about it)? HS: My current work-in-progress is going slowly at the moment as I have a lot of research to do. It’s still a Regency but that is its only similarity to anything else I have written. I can’t really divulge its theme, only that it is the story of a young bride who absconds from her husband after just one month of marriage. Her reasons are what drives the story. However, you can be assured of a happy ending. Bio: Hazel Statham lives in Staffordshire, England. She started writing at fifteen and has written on and off ever since. She has always been fascinated by history and writes mainly in the Regency and Georgian eras, although she has been known to occasionally stray into Medieval times. 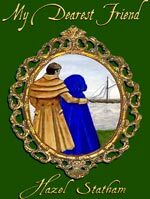 Writing is a compulsion she just can’t ignore and her work has been mainly influenced by Heyer, Bronte and Austen, although over the years, she has read many authors who have inspired her. When she was a child, she often told herself stories and this just progressed to committing them to paper to entertain family and friends. However, there have been gaps in her writing years where marriage and employment have intervened, but now that she no longer works, she is able to return to her first love and devote her time to writing. She had her first two novels published in 2005. She has been married to her husband, Terry, since 1969 and have a grown daughter and beautiful grandson. Apart from reading and writing historical novels, her other ruling passion is animals and until recently, she was treasurer for an organisation that raised money for animal charities. She currently shares her home with a lovely yellow Labrador named Lucy, who is her constant companion. Lucy is a real sweetie, but it’s not always easy working at the computer with a large Labrador trying to get on your knee! Her books is available at the Wings Press website. To read more about the ups and downs of the freelance writing liffe, visit Ink in My Coffee. By Hazel Statham. KY: Wings e-Press Inc. 2008. $6 Download; $11.95 Paperback. My Dearest Friend traces the growth of the love between Jane Chandler and Robert Blake, the Duke of Lear. Jane requests the Duke’s assistance in returning her wounded brother back from Portugal to England. The Duke, riddled with guilt because he could not save his own brother from the conflict, is more than eager to help. Along the way, they encounter adventure, treachery, illness, and find out that the Duke’s brother has a now-orphaned child. What starts as friendship blossoms into love between Jane and the Duke as they support each other through this difficult time. It’s when they are home and married that trouble brews, most of it caused by the tenant now renting Jane’s former home. How they are torn apart and fight to find a way back together over rocky emotional terrain makes a lively, warm, and intriguing read. Regency historicals are tricky; Statham takes us beyond the confines of the genre in the best possible way with her depiction of the genuine friendship and caring that forms the basis for their love, instead of one party simply being determined to “tame” the other. The mutual respect and regard for each other makes this a cut above most books in the genre.